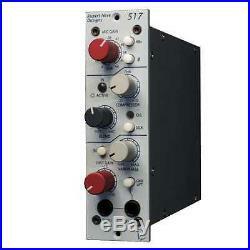 Rupert Neve Designs 517 Mic Preamp/DI/Compressor 500 Series. Rupert Neve Designs 517 500 Series. Silk: Much could be written about this feature, suffice to say, that it gives a subtle option to enhance sound quality in the direction of vintage modules. We suggest you try it and make your own judgment. Mic Gain: Mic gain is from 0dB to 66dB. Overall gain to restore the apparent program level. DI Gain: DI Gain is from 0dB to 30dB. DI input: Balanced or unbalanced Hi-Z input for instruments. Phantom power: Provides 48v phantom power to microphones. Controlled by the 48V switch. Polarity reverse: Reverses the polarity of the mic input. Threshold: When signals exceed the "threshold" level, the gain is reduced at a controlled 2:1 ratio, with fixed attack and release time constants. Indicators: Indicators on the 517 denote signal presence and clipping on both DI and mic signals, as well as compressor activation. Noise: Measured at Main Output, unweighted, 22Hz-22kHz, Terminated 150 Ohms. With gain at unity better than 100 dBu With gain at 66 dB better than 62 dBu Equivalent Input Noise better than 128 dBu Noise Factor 1.5dB. Maximum Output Level: Maximum output from 20 Hz to 40 kHz is +23 dBu. Phantom Power: +48 Volts DC +/- 1%. This mint condition product includes the original box, manual, and all original accessories. These charges are the buyers responsibility. The item "Rupert Neve Designs 517 Mic Preamp/DI/Compressor 500 Series" is in sale since Thursday, June 11, 2015.